2017 Flipped Learning Leader, Kevin Revell! Building a Strong Foundation...Your Way! Building a Foundation with an Integrated Learning Experience. 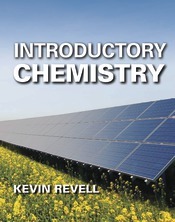 At its core, Introductory Chemistry is the result of a unique author vision to develop a robust combination of text and digital resources that motivate and build student confidence while providing a foundation for their success. Kevin Revell knows and understands students today. His thoughtful narrative/video/interactive program works seamlessly to provide the most accessible and engaging set of resources for introductory chemistry available. The same author voice is mirrored in all print and digital content, allowing students flexibility and ensuring a fully supported learning experience—whether using a book or going completely digital! Building a Foundation... Your Way! Written and developed as a flexible print and digital resource, Introductory Chemistry is designed to serve as a teaching and learning tool to meet instructors and students where they are today and provide support and tools tailored to various learning and teaching styles. Introductory Chemistry comes with a full suite of traditional textbook and lecture resources to support a traditional lecture-based course, as well as resources that make the transition to a more active classroom easier for instructors interested in doing so. Instructors who already subscribe to active learning techniques will also find tools to complement their efforts. Students can choose to access the content in the learning environment that best fits their needs: the printed narrative and pedagogy, the eBook and interactive digital tools, the video lecture modules, or a combination.